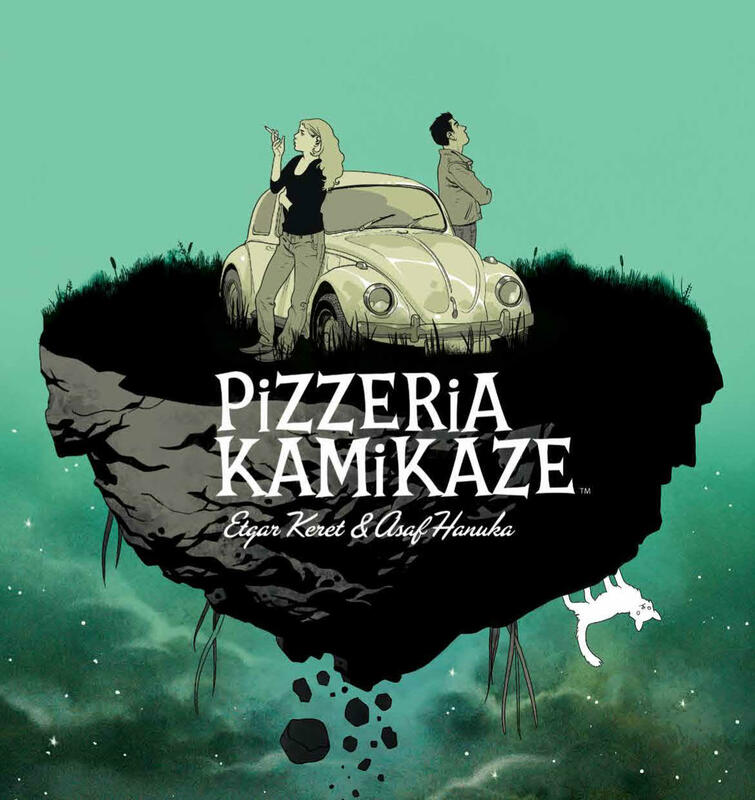 'Pizzeria Kamikaze' takes a darkly humorous, yet deeply respectful look at suicide – AiPT! A beautifully melancholy graphic novel. After committing suicide, a young man named Mordy wakes up to find himself in an afterlife somehow even more mundane than the life he left, and it’s populated entirely by people who killed themselves. His new job in this life? Baking pizzas at a sweaty little corner joint called the Kamikaze. Not long after he arrives he learns that his ex has also arrived in the same place, so he goes on a road trip to find her, dragging along his abrasive best friend and a hitchhiker who is certain she’s in the wrong afterlife. They change lanes from absurd to mundane and back again in this piercingly sarcastic, yet earnestly sympathetic tale. This new edition of Pizzeria Kamikaze presents Etgar Keret and Asaf Hanuka’s graphic novel in full color for the first time, courtesy of colorist Dan Jackson. When the book first released in English in 2007 it was nominated for an Eisner Award, and that was just in black-and-white. I missed out the first time around, but I’m glad this was my introduction, because the colors add a lot of mood to the artwork, and its shifting palettes help the reader flow between often disjointed scenes, like they’re carrying you through a dream. Jackson did a wonderful job heightening the atmosphere of each scene, whether it was to add silliness or solemnity. No slight meant to Asaf Hanuka, but I can’t imagine this story being nearly as effective without the colors. It’s a shame Jackson didn’t get a cover credit on the book, he more than earned it. Hanuka’s linework isn’t quite as elegant as some of his more recent cartooning in The Realist volumes Archaia has also collected, but the grittier, more shadowy style perfectly fits the story’s dark tone. The characters are just cartoonish enough to be unreal, but just realistic enough to be unsettling, and that tension can be felt throughout the strange world of the afterlife, which is only ever mundane and normal long enough for you to let your guard down so it can slap you in the face with something absurd. It takes a careful touch to handle such heavy subject matter, but Keret’s story never comes across as insensitive, even when it’s at its weirdest, or most sardonic. Suicide is treated as something all-too-familiar, but also ultimately incomprehensible, and the result is a story that’s as compassionate as it is a thought-provoking exploration of the issue. The only problem is that it ends way too soon; it’s a quick read that seems to suddenly end just as it’s getting going. Maybe that’s just another way the book is commenting on its subject, but either way, the comic’s world had more than enough story potential to justify further exploration. Pizzeria Kamikaze is a beautifully melancholy graphic novel that provides a story with a truly unique perspective on suicide and depression. It’s definitely not for every reader, but if you can handle some dark humor and themes, then you’re in for an engaging–though too brief–reading experience. A thought-provoking and beautifully-illustrated graphic novel that takes a somehow both darkly humorous and deeply respectful look at suicide.